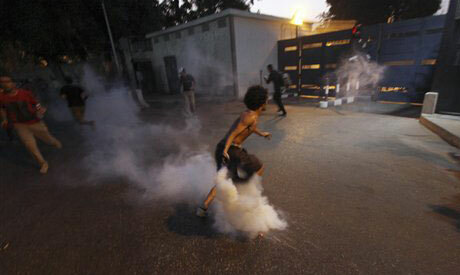 A protester throws tear gas back at Egyptian riot police, unseen, during clashes outside the Syrian embassy in Cairo, Egypt, Wednesday, July 18, 2012. Egyptian security forces have fired tear gas to push back several hundred protesters trying to storm the Syrian Embassy in Cairo and raise the green-striped flag of Syria's rebels(Photo: AP). According to the MENA news agency, an official source stated Wednesday that 14 soldiers were injured and two security forces vehicles were destroyed in front of the Syrian embassy in Cairo late Wednesday after clashes erupted between security forces and protesters. A number of demonstrators gathered in front of the Syrian embassy to call for the expulsion of the Syrian ambassador in the wake of an ongoing military crackdown on protest movements in Syria that has claimed over 15,000 lives by credible estimates. On Wednesday, a suicide bomb attack in Damascus killed several high-profile Syrian officials, signalling for many observers the opening of the final phase of the struggle between the Bashar Al-Assad regime and opposition forces. The country's defence minister, Al-Assad's brother-in-law, and the interior minister were reported dead. In ongoing violence, nearly 100 people were killed across Syria, including 16 in Damascus, said the Syrian Observatory for Human Rights. In Cairo, the source added that five people were arrested outside the Syrian embassy and sent to the prosecutor general for interrogation. Security forces used tear gases and sound bombs to disperse protesters who threw stones and tried to storm the embassy and pull down the Syrian flag and replace it with the independence flag.